What? 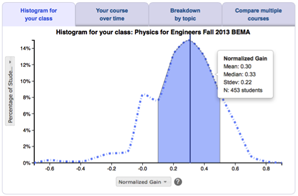 Comprehensive learning system for introductory physics that engages students in experiences that mirror experiences of practicing scientists. Builds on students' correct intuitions rather than eliciting and confronting their misconceptions. Intro Article: E. Etkina and A. Van Heuvelen, Investigative Science Learning Environment - A Science Process Approach to Learning Physics, in Research-Based Reform of University Physics (2007), Vol. 1. You can download many materials for teaching ISLE, including a complete ISLE Laboratory Program (for algebra- and calculus-based physics), a set of ISLE Video Experiments, and a set of higher-level thinking formative assessment activities and rubrics from the ISLE website. You can also purchase the Active Learning Guide for College Physics, which contains activities and problems that can be used in lectures, recitations, labs, and homework for concept construction, testing and applications, or College Physics, a textbook based on ISLE. M. Cancula, G. Planinšic, and E. Etkina, Analyzing patterns in experts' approaches to solving experimental problems, Am. J. Phys. 83 (4), 366 (2015). D. Demaree and Y. Lin, Assessing ISLE Labs as an Enhancement to Traditional Large-Lecture Courses at the Ohio State University, presented at the Physics Education Research Conference 2005, Salt Lake City, Utah, 2005. E. Etkina and A. Van Heuvelen, Investigative Science Learning Environment - A Science Process Approach to Learning Physics, in Research-Based Reform of University Physics (2007), Vol. 1. E. Etkina and A. Van Heuvelen, Investigative Science Learning Environment: Using the processes of science and cognitive strategies to learn physics, presented at the Physics Education Research Conference 2001, Rochester, New York, 2001. E. Etkina, Millikan award lecture: Students of physics—Listeners, observers, or collaborative participants in physics scientific practices?, Am. J. Phys. 83 (8), 669 (2015). E. Etkina, A. Van Heuvelen, A. Karelina, M. Ruibal-Villasenor, and D. Rosengrant, Spending Time on Design: Does It Hurt Physics Learning?, presented at the Physics Education Research Conference 2007, Greensboro, NC, 2007. E. Etkina, S. Murthy, and X. Zou, Using introductory labs to engage students in experimental design, Am. J. Phys. 74 (11), 979 (2006). X. Zou, How students justify their knowledge in the Investigative Science Learning Environment, presented at the Physics Education Research Conference 2003, Madison, WI, 2003.